Pixar have taken us to so many places; the scare-driven city of Monstropolis, the secret life of Toys in a kid’s bedroom, the bottom of the ocean, a lifelong ambition to journey to Paradise Falls and the inner workings of a young girls head, but this is their most different so far. Pixar’s Coco tells the tale of an aspiring musician, 12-year-old Miguel, who is confronted with his family’s ancestral ban on all things music, and when he plays the cords of a legendary singer’s guitar, he enters the Land of the Dead and must find a way to escape. Pixar have proven time and time again that they are the top of the animation game with nearly all of their films becoming instant classics such as Wall·E (2008), The Incredibles (2004), Brave (2012), Ratatouille (2007) and A Bugs Life (1998), and Coco proves they still are. This is easily one of the best animated films of the past few years with photo-realistic imagery that could fool even the best of animators into thinking they were watching a live action movie. But the imagery can only do so much and can’t make a story better. Luckily, this is Pixar, who have crafted a brilliant story for kids and adults alike. The story takes place around Mexico’s famous Day of the Dead festival, where the dead come back to the Land of the Living via an Aztec marigold petal bridge to visit their loved ones as long as their photo is on display in a family’s ofrenda. The festival has been used many time over the past few years, and it isn’t hard to see why. It’s a celebration of life and family in a blizzard of fluorescent lights, skeletons and food that’s ripe for the big screen and Pixar captures it perfectly. There’s a lot of information given about the festival and the Land of the Dead in some expositional-heavy scenes, but they deliver it in such a quick and spaced out way that it’s easy to absorb and understand. On the initial reveal of the movie with the trailer and posters, there were a lot of similarities to Guillermo Del Toro produced Book of Life (2014), which is also set around the Day of the Dead, features plenty of songs and features the guitar playing main character being stuck in the Land of the Dead after he refuses his family heritage of becoming a bull fighter to pursue a career as a musician. 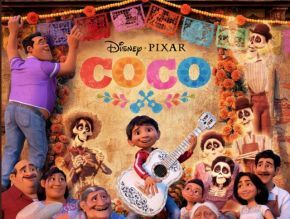 Within 10 minutes, it becomes apparent that Coco is a vastly different movie and, arguably, much better, with a realistic story about family, a better visual representation of the Land of the Dead and much more enchanting musical numbers. This is the closest Pixar has come to making a musical with many catchy songs from Frozen (2013) songwriters Robert Lopez and Kristen Anderson-Lopez, dotted throughout to liven up the festivities and provide some truly powerful and emotional moments. Anthony Gonzalez and Gael Garcia Bernal, who play main characters Miguel and Hector, are fantastic singers and give each song their all with the same power and passion that emanates from all of Pixar’s gallery of voice talent. All of the characters in this film are brilliantly realised with believable motivations. Each of the family members have their own colourful characteristics and voices that separate them apart and create a great dynamic between them all, from the identical twins to the strict grandmother. This is Pixar’s first movie to features an all-latino cast, with the exception of their lucky charm John Ratzenberger, who has appeared in all of their films to date, including Cars (2006) and The Good Dinosaur (2015). Like most Pixar movies, Coco has two leads: Miguel and Hector. Their chemistry is perfect and their interactions are brilliant. The scenes involving Hector dancing and disassembling himself are wonderful to watch, and makes a change from the average skeletons in big movies like this. But no Disney film would be complete without an animal sidekick, and this one has plenty. In the Land of the Dead, we meet several types of spirit guides. They can be anything from small monkeys to other huge Alebrijes. The spirit guides are some of the most visually interesting creations in this film with glowing multi-coloured appearances that looks stunning. Miguel’s sidekick is a Xoloitzcuintli dog called Dante. He acts as a comedy character most of the time, but luckily he does have some truly hysterical slap-stick moments and he is animated wonderfully like the rest of the characters and proves to be just as lovable as them. In terms of Pixar’s comedic side, Coco feels more serious than their average outings, but lightens the mood whenever it can. It goes for a heartfelt tone that Pixar is most famous for and contains some incredibly touching and moving scenes as Miguel realises the importance of family and the freedom of creativity. Overall, this is easily Pixar’s best since Inside Out (2015). It is a magical adventure along a beautifully crafted story that could take you anywhere with some of Pixar’s best characters. Coco has set the bar for the year ahead and it will not easily be topped. Purple Revolver rating: 5/5. Another Pixar classic.